Il 20 gennaio scorso il card. 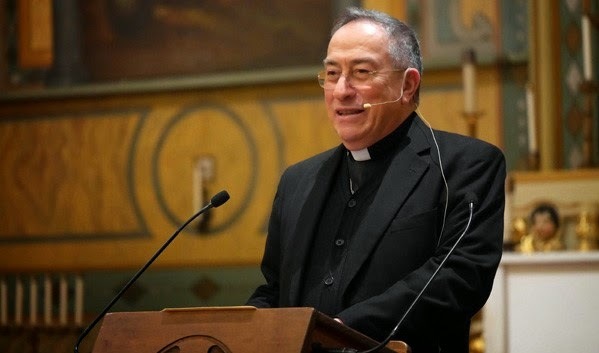 Oscar A. Rodríguez Maradiaga, arcivescovo di Tegucigalpa (Honduras) e coordinatore del Consiglio dei cardinali, ha tenuto una conferenza presso il Markkula Center for Applied Ethics hosted della Santa Clara University (California), intitolata "The Meaning of Mercy" ("Il significato della misericordia"). Ne pubblichiamo gli ultimi due paragrafi, che fanno diretto riferimento al cammino sinodale in corso. Il testo integrale si può trovare qui mentre il video si trova qui. In the Family Synod (October 2014) something notable happened for the first time: There were like two Synods because outside the precinct where the Synod Fathers were gathered, there was a media Synod that denoted a perverse intention to confuse opinions, invent answers, imagine solutions and exaggerate positions of those of us gathered there; instead, inside the working room a charismatic, serene, cordial, filled-with-unction-and-faith synod was taking place, seeking to agree and to answer the essential issues of family and marriage. Many identified as the unique and fundamental topic, issues that were merely secondary. For example, we did not talk only about giving “communion” to re-married Christians - that was a collateral argument, it was never essential. What was really said, and I repeat and emphasize, is that the realities of dissolved and rebuilt families are not an impediment to live and participate in the abundant life of the Church; that the “sacramental communion” is not the only way to vitally participate in the pastoral dynamic of the parish community and that every Christian couple that seeks God will find Him because he allows Himself to be found and that every re-married Christian can be a full-time Christian, has a right to be happy, and his house can become also a place where the love of God is born witness. For me, there is no “place in the basement” of the Church for Catholics that have wanted to rebuild their lives having remarried, though they cannot receive the Sacrament of Communion; there is no corner in attic for migrants that do not have documents in order and want to prepare their children in the sacraments of Christian Initiation; there is no special window in Heaven to assist those who have left the Catholic Church and have gone to other places seeking the warmth, refuge and respect that their mother has not been able to provide. All these are challenges to our conscience and a strong and tough demand to our parish practices that are so rigid and narrow-minded. That is why the Pope said to be careful not to turn the parish and episcopal offices into “customs.” And he is completely right (Santa Marta, May 25, 2013). To remember the whole message, I quote: “We are many times ‘controllers of faith,’ instead of becoming ‘facilitators’ of the faith of the people," lamented the Pope during his daily mass at Santa Marta’s Guest House in the Vatican. In his homily that was broadcasted by Vatican Radio, the Argentine Pope mentioned a priest who refused to baptize the son of a single mother, “this girl who had the courage to carry her pregnancy (…) and what does she find? A closed door,” affirmed the Pope. Nobody is excluded from the Church of Christ. There is a place for everybody, for the migrants, for those who one day abandoned the Church but come back convinced that they can stay forever, for those married-divorced-remarried, for the poor, for everybody. Within these categories fall those that Francis calls “the least”, when he encourages: “The Church must step outside herself. To go where? To the outskirts of existence, whatever they may be. If we step outside ourselves we find poverty. We cannot put up with this! We cannot become starched Christians, those over-educated Christians who speak of theological matters as they calmly sip their tea. No! We must become courageous Christians and go in search of the people who are the very flesh of Christ, those who are the flesh of Christ! (Vigil of Pentecost, May 18, 2013). The Pope’s words sounded strong when he said, “Be men and women with others and for others: true champions at the service of others” (December 2, 2013). Following this, the Holy Father tells us something fundamental, three points that I want to share with you today to finish my talk here: “In your society, which is deeply marked by secularization, I encourage you also to be present in the public debate, in all the areas where man is at issue, to make God’s mercy and his tenderness for every creature visible.” Yes, dear Friends, let it be a task and commitment for you to work courageously and heroically “where man is at issue.” Only in that manner will we bear witness of God’s mercy, the mercy that is love —and love that begins at home. The incarnate aspect of spirituality, turning life into a transcendental humanism according to the Spirit, is what lays the foundation for the Christian mystic. It is focused on the search for God through Jesus, but also focused on man and the search for fraternal love. It lives in the hope that the Kingdom will have no end but it centers completely on the tasks of a Kingdom in history and in society. It receives faith as a gift from God, irrepressible to any human experience, but it knows that faith takes diverse shapes and demands according to the cultures, the challenges of society and the individual commitment, and that all human or Christian commitment must also be a place of the experience of God. Since certainly, the privileged “place” in which Christ’s Mercy becomes incarnate and becomes practice is in the love for the brothers and sisters, and in the preferential love for the poor and the suffering. The temporal reality that summarizes all the incarnations of the mystic, all the realism of the Christian spirit, and that gathers all the demands of the practice of the faith and love, is the brother, is the poor. The God hiding in the faces of our brothers is the supreme experience of incarnation and to practice mercy is it’s definitive stamp because “mercy is the true force that can save man and the world” (September 15, 2013).